Google Docs (now part of Google Drive) is a suite of free ‘office’ applications that are online (in ‘the cloud’) rather than installed on your own computer. They include word processing, spreadsheet, presentation and more. The huge advantage of working with a ‘cloud’ application rather than a local one is that documents are available from any computer with an internet connection. If you create a document it will initially be private, but can be shared with others. Once shared you know that the document you are working on IS ALWAYS the up to date version because there is only the one document which everyone accesses to make revisions. Microsoft Office documents can be imported to be edited and shared. PDF and graphic files can be uploaded to be stored and shared too. You can create folders and sub folders of documents, and share entire folders if you wish. If you have a Gmail (googlemail) account or another existing Google account you can easily add Google Docs to it. Start at http://docs.google.com and either log in or set up a new account if you need one. Remember to let others know the email address you register with so they can share documents with you. When sharing a document you can decide if the users you invite are ‘editors’ (can make any changes); can ‘comment’ (not change the text but leave margin notes); or ‘viewers’ (can only view a document but not to make any changes). You can assign different rights to different people. The document ‘owner’ is the only person who can actually delete a document entirely. Note too that documents are automatically saved as you work on them. There is no ‘save’ menu option! Documents that others share with you will initially be under ‘Shared with me’ on the left-hand menu. You can start viewing and editing them there and you can organise them along with your own documents by dragging them online gaming casinos into the ‘My Drive’ area. When you have many documents it is a good idea to create folders under ‘My Drive’ and organise documents by dragging them into these. If others are online looking at the same shared document as you this is shown by their user name appearing toward the top right next to a colour. You can actually text chat in real time if you wish, and you will see them editing in real time! ‘Comments’ are incredibly useful if you want to add a margin note for others to see without messing up the document itself. 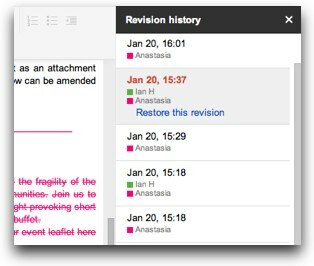 Highlight some text to annotate a particular portion of the document and choose ‘comment’ from the ‘insert’ menu. Others can reply to your comments too. You can also click the ‘Comments’ button to the top right of the document to see all and add general comments. ‘See revision history’ is like ‘track changes’ in Microsoft Office, and available from the ‘File’ menu. Should you want to retrieve some old text you could find it in revision history, copy it, then close the revision history view to get back to the current version, and then paste the text you retrieved back into the current document. Documents can be downloaded in common Office file formats and as PDF (the most useful format to ensure everyone sees a no longer editable file with the same page layout regardless of their computer). Comments are NOT downloaded with documents. 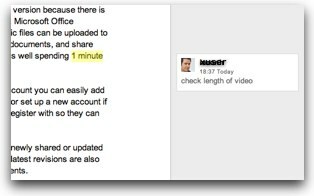 A comment alongside document text. The yellow highlight shows what is being commented on. It is possible to click on a comment by another user and reply. Comments are not printed or exported when choosing to ‘download’ a document. Comments work in spreadsheets too, but here they are attached to individual cells and shown when you roll-over the relevant cell (identified with a yellow corner marker). Here the Revision History is showing that at 15:37 on Jan 20 the text in red was deleted. Use this view to find changes in a document and see who made them. When done just click the ‘X’ to close this view and go back to the document in it’s current state.